Many human diseases are caused by mutations in our genes that lead to altered function of important proteins. Gene therapy is an approach aimed at correcting these mutations by delivering a functional copy of the gene to our cells. Unlike conventional treatments, gene therapy can provide therapeutic effects lasting months to years with a single treatment, revolutionizing the way we treat many debilitating and/or life-threating diseases. WHY is inhaled gene therapy hard? Our airways are readily accessible by inhalation, and therefore, appear to be an easy target for inhaled gene therapies. However, many physiological barriers exist to effective gene delivery via the airways. One formidable barrier is the sticky mucus gel layer lining the surfaces of our airways. This mucus layer traps gene carriers and prevents them from reaching the target cells. Clinical trials for treating diseases affecting the airways, such as cystic fibrosis, have failed in the past because promising genes could not be carried across this mucus layer. HOW might it save lives? Synthetic, non-viral gene vectors (DNA nanoparticles) that can rapidly penetrate the mucus gel layer are being developed as specialized gene delivery systems by researchers led by Jung Soo Suk in the Center of Nanomedicine. 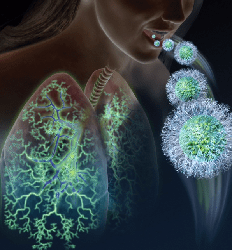 This new system would be able to treat cystic fibrosis, chronic obstructive pulmonary disease, and asthma by delivering corrective genes to restore protein function and/or regulate immune responses. In collaboration with scientists at the University of Florida (Arun Srivastava), Jung Soo Suk and the CNM research team are also developing viral gene carriers modified to evade recognition by immune cells as well as effectively penetrate the mucus layer. The CNM researchers have demonstrated that mucus-penetrating DNA nanoparticles (DNA-MPP) can be formulated to have a dense non-sticky polymer coating, which prevents adhesion to mucus. 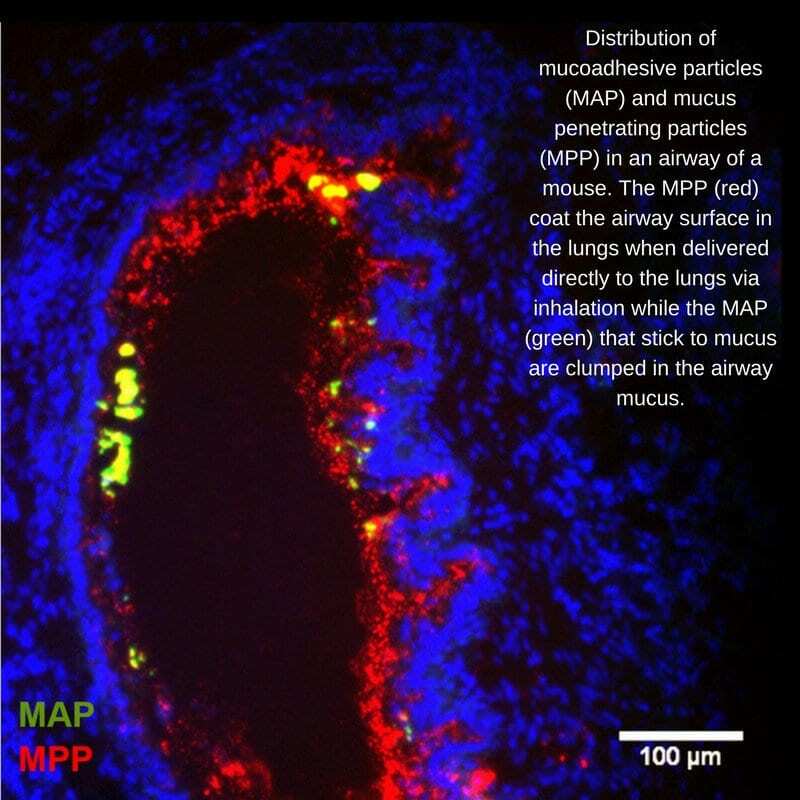 Moreover, this coating also improves distribution of the nanoparticles over surfaces of the airways, and more significantly, enhances the delivery of DNA into airway cells. The mucus-penetrating DNA nanoparticles developed by CNM researchers represent the first biodegradable gene delivery system that is efficiently penetrates the human airway mucus barrier. Compared to a non-biodegradable gene vector system already in clinical trials, the DNA-MPPs provided markedly increased gene delivery and protein expression following inhalation in mice.